The Impact LiteTrek 4.0 DC Flash Head offers a wide array of advanced studio and DSLR-friendly features in a lightweight (2.6 lb) head intended for use in the field where AC power is unavailable. Starting with strong core specs like 400W/s of power delivered promptly in 2 seconds at full power, the head offers 5 stops of output variability with action-stopping flash durations as low as 1/14000 sec. Consistency is stressed at every stage of production, evident in the tight +/-100K tolerance in its 5500K flash tube. The Autodump feature automatically "bleeds" extra power from the capacitors when powered down. Advanced features include Multi Mode which allows you to utilize stroboscopic technology for motion studies or sports, as well as Quick Mode which automatically powers down the flash to permit focal plane shooting at shutter speeds as short as 1/13,000 sec. Convenience features include a removable power cord and stand mount for easy packing. The LiteTrek 4.0 requires a power source and requires the optional Impact LiteTrek (LT) Battery Pack system which offers 650 maximum power flashes or 3500 minimum power flashes on a single charge. "Being able to use a small, lightweight, super-portable pack like this just makes things so much easier. Being able to have studio-quality lighting on location, without hauling loads of gear around makes a big difference for anybody who thinks "less is more". Used this rig last week for a dusk shoot, and it worked like a charm and refreshed much faster than I was expecting." FP, for "focal plane," produces a succession of flashes at a very fast speed in order to illuminate the sensor as evenly as possible when shooting with fast shutter speeds (typically above 1/250s). This series of flashes is usually not noticeable with the naked eye. When using the FP settings, be aware that the flash will output at its lowest power setting to compensate for the fast burst speeds. Removable stand mount and power cord for easy packing. Multi Mode produces a series of continuous flashes for a single exposure. These pulses of light allow you to freeze several moments of progressive motion for creative or scientific effects. Create your own Edward Muybridge-style locomotion studies. Use the included sync cord, optical slave or Impact or other brand radio slave. 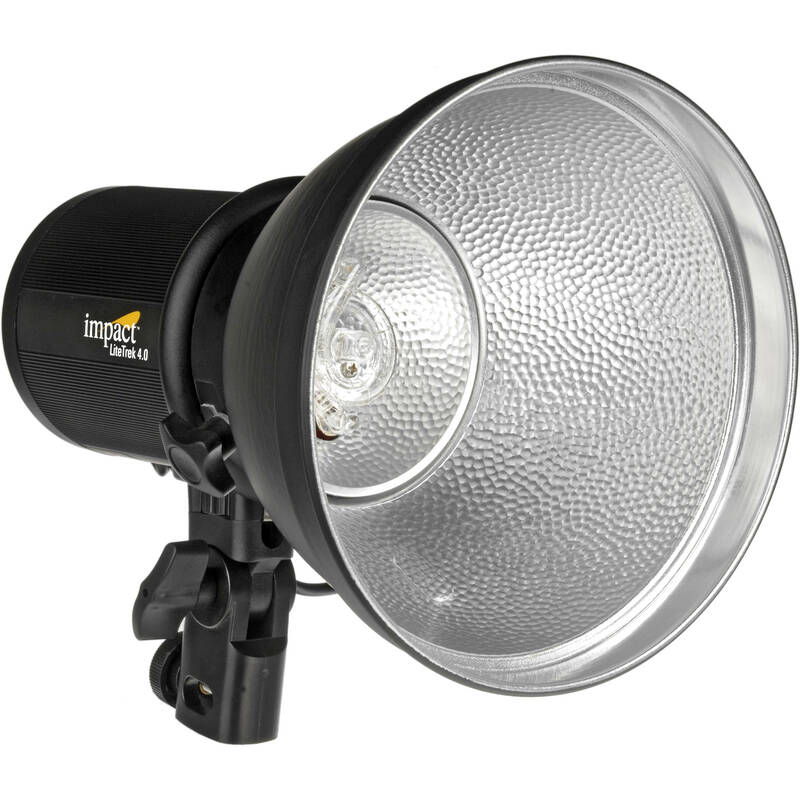 Box Dimensions (LxWxH) 11.8 x 8.0 x 7.9"
LiteTrek 4.0 DC Flash Head is rated 4.0 out of 5 by 5. Rated 5 out of 5 by Bernardo M. from Excelent strobe for the price! I bought this strobe as a complement of the Impact LiteTrek 4.0 DC Monolight and Mini LiteTrek (LT) Battery Pack Kit and it works great. My only complain is that the power cords are not long enough to use two strobes with the same battery. If you're going to use them close one to another that's fine, otherwise... you should think about a second battery. Rated 3 out of 5 by Anonymous from Using 2 Flash Head on a single battery is problematic I first bought one spot and was very satisfy by the power and the ability to shoot anywhere with a battery so i bought a second one. Yes, you can connect 2 flash on the same battery but you have only one option with the cables. You have to use the proprietary cables provided with the kit. I thought i could find third party cables but not. You have to use Impact Cables. Only 10 feet for one and 7 feet for the second one. This is really too short when you what to shoot a head to toe subject. I contact Impact and you can't find any longer cables even third party cables. So if you want to use only one spot this is an interesting flash but for 2 or more you will have to buy another 550$ battery eventually. Rated 5 out of 5 by Anonymous from I highly recommend these flash heads. I purchased these lights to photograph a pageant and they surpassed my expectations. I had to turn the power way down for the glamor shots. There was more than enough light for the group shots. Re-charge lag is nonexistent at settings other than full power. At full power lag time is about 1/2 a second. The digital controls are a snap to use. Light and very portable. Rated 3 out of 5 by syl210 from good product I haven't fully used it so I can't give it a higher rating yet. I just test used it. Rated 4 out of 5 by Shriyan from Good one, came with Kit It came with kit. Why are you refusing to answer the question on whether or not a battery is included ? Unfortunately, the battery is not included with the Impact flash head. The correct battery is the Impact Mini LiteTrek (LT) Battery Pack B&amp;H # IMMLTPBP. Is a battery included ? The battery is not included, but that would be the Impact Mini LiteTrek (LT) Battery Pack B&amp;H # IMMLTPBP. Does this come with a battery pack or what? The Impact LiteTrek 4.0 DC Flash Head, B&amp;H # IMLTFH, does not include a battery; only the items listed under the In The Box section under the Overview tab on our website are included. If you need a battery for use with the above item, the Impact Mini LiteTrek (LT) Battery Pack, B&amp;H # IMMLTPBP, would be the correct battery for your purchase needs. I have lost my instruction manual and cannot remember if this unit has a fuse. Also ifs their a repair shop in Germany that can repair the unit? Can this be triggered using a Yongnuo slave or a SB800? A Yongnuo trigger can be connected via the 3.5mm sync port or you can optically trigger this head with an SB-800 that is set in manual power mode. This monolight does not include a battery pack. The dedicated battery pack would be the Impact Mini LiteTrek (LT) Battery Pack B&amp;H # IMMLTPBP. Does this need a battery pack or is the battery right in the head? You need this battery :https://&lt;a href= http://www.bhphotovideo.com/c/product/695135-REG/Impact_10052520_LiteTrek_4_0_Monolight_and.html target= _blank &gt;www.bhphotovideo.com/c/product/695135-REG/Impact_10052520_LiteTrek_4_0_Monolight_and.html&lt;/a&gt;Be aware the cord is short and proprietary (max 10 feet). I have not determined the duration of battery life, since I have used the unit indoors (implying access to a power source) and at most for two hours for each shoot. I have had no issues for this limited duration.